Oh my goodness! This is such a good idea!!! And so adorable! Thanks for sharing! aww this is sooo cute! I love everything about it especially the pocket for the money! great job Emma! What a creative idea Emma. I love it and would love to win Twinkle Toes! Can't what to see what you come up with tomorrow. HOLY FRIGGIN" CUTENESS BESTIE!!! I am now SUPER hopeful that my carts will arrive today!!!!!!!!!! what a great idea, hmmmmm my big wheels are turning now! Love the elf and his money wagon. I am kicking myself for not getting that cartridge since I was at WalMart at 12:00 and had it in my hot little hands. You are right - this is the cutest money card I have ever seen! Just adorable! thanks for sharing! Emma tooooo cute! And you are so right about the PK faces stamps, I am 'patiently' waiting for my first order of them. I have been giving $$ to nieces&nephews for a couple years now and always struggle with a 'way' to spice up the giving of it...love your little elf, now I just need to get that cartridge! Thanks for continuing to inspire me. Such a cute card! TFS. Emma!!! This is so super cute! This is such a cute idea! I have quite a few teenage nieces and nephews - this would be perfect for them! So much cuter than just putting money inside the card! TFS! wow you amaze me emma, do you ever get creative block? This is so stinkin cute! OH MY what an adorable money holder!! Love watching you use the Gypsy, can't wait till Santa brings mine!! Thanks for this fabulous idea!! EMMA!!! This is SO cute! I love that the wagon holds the money! So cute. Thanks for all the fun. me(at)glorajean(dot)com. OMG this money holder is so super cute!!!! I have not been able to get my hands on that cart! Sold out everywhere!!!! Twinkle Toes is another one I have my eye on..Nice giveaway!!! EMMA THIS IS JUST TOOOOOO CUTE!!! I love (as you already know) coming to your blog and getting inspired!!!!!!! 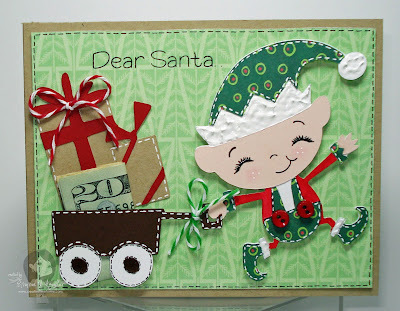 Super cute card Em, I love the paper you used on the elf. Now that little elf is so stinkin' cute! You amaze me everyday! Love it! Oh my god!! like always you make the most beautiful, kute and fantastic projets!! and for your give away I want to be a HAPPY CAMPER :) I want this so bad my daughter has dance classes and need this one. thanks Emma. This is so stinking cute!!! I'm totally stealing this idea. I LOVE Jolly Holidays. I just made a wedding shower card for my future sister in law with the adorable penguins on there... it will be on my blog later today! Emma...this is so stinkin' cute. Thanks for sharing. I love your 12 days of Christmas. i dont know what id be more excited about the money or the adorable holder!! Loving all of your projects !!! Martha C.
Emma - I just got this cart and I am soooo gonna steal this - lol! I have been making tons of gift card holders and this is just such a cute twist - thanks! such a cute card, I am running out the door to walmart right now to see if I can get this cart. I looked at it last night and it was the last one there so hopefully it will STILL be there... great insiration! Too cute! Looking forward to more. What a cute card! TFS I am on my way to Nikki blog! yah! I picked up this cart on Black Friday!I'm off to make a card right now! Thank you Emma and Nikki for the daily fun! Debbie H.
I love the way you stuck in the $20 so cute and creative. The whole card is adorable I definitely need to go out and get jolly holidays! Thanks for the inspiration and the chance at a great giveaway! THat is such a cute card! I love this cart...I had to get it on Black Friday and I'm SO GLAD that I did. I didn't get Twinkle Toes though and would LOVE to win it! Thanks for the chance! I can't wait to see what you have next!!! Super cute! Love the paper and details! Emma, thanks for sharing your creativity. This is such a unique card idea. I am always inspired by your work. What a cute gift card! Watching you with Gypsy, makes me want to get one! What an adorable idea. I don't have this cart yet, but it is on my list! Love the elf face too, so happy and jolly. Oh Emma... I must agree, this is the cutest money holder EVER!! The elf is so stinkin cute. I have this cart and those stamps, so I am definately going to use them together. Thanks for always inspiring me. Happy Holidays! This is just too stinkin CUTE. I've got to try this one. Where did you purchase the Glossy Ultra Paint? OMG!!! I love love love this card!!! Jolly Holidays is the cutest cart ever!! TFS! Love it! What a super cute card! Cute card I need some peachy keen stamps. Thanks for sharing. Emma, I love your card and did pick up Jolly Holiday cartridge. I love the ideas you come up with. I will be adding Snow Angel cartridge soon also. Oh My goodness you have done another faboulous card. That elf is the sweetest little guy! You are so cute! What a darling, darling project... can't wait for tomorrow!! What a cute and clever idea for a money holder. Super Cute Emma! I LOVE this!! Such a cute idea. Your elf is just adorable!! WOW Emma you are amazing!!! This is adorable:)The little elf is too cute!! GREAT card!!! Never would have thought to use a Princess face on the little boy elf - but it works perfect!!! And you are SO nice to give away Twinkle Toes! Thanks for the chance to win! That card is my all new favorite. Love it. Absolutely love it. Thanks for the demo. I am so loving your 12 days of Christmas. Oh Emma! This little elf is the cutest! I love him! Peachy Keen Stamps is da BomB! This cartridge is on my Christmas wish list! Thanks for the wonderful giveaways! LOVE the elf card!!! Have been looking at the Twinkle Toes cart but ran out of funds. Thanks for the chance to win. this has to be my favorite so far. This card is so adorable. Thanks for sharing another awesome project. Very Cute Elf... another couple cartridges on my wish list. Thanks for a chance to win. so cute !!! thanks for your great videos ! thanks for the chance to win !! Oh really cute card. Love how you tucked the money in there. My older boys would love this. They are getting hard to buy presents for. As for that cartridge. My daughter and I have been eyeballing it. Thanks for a great giveaway. Love how you dressed that happy little elf! Great idea for a money holder...tfs! Great idea for the money holder! After seeing this video, I have 2nd thought about the Cricut Imagine. I got it when it was out and returned it because I didn't think I'm going to use the printing feature. Now that I saw you use it I definitely going get it again. Thanks for sharing your wonderful designs!!!!!! What a cute elf card!! Thanks for the chance to win! What a cute idea to use the wagon as a money holder! I love it! the outfit for the elf was absolutely adorable and i don't think anyone would have been able to tell the face was from a girly set of stamps. you did an excellent job once again. OMG I love this How cute too. Your so talented Miss Emma. I love all these ideas. You andNikki have worked very hard. Thank You. That card is ADORABLE!! Must get that cart! Don't know when I'd use it tho as I am drowning in those ornaments you showed on day 1 (? )..or whenever! this is a very cute card.love your creations and thanks for the 12 days of christmas.im sure enjoying it. Absolutely adorable. I can see I am missing out on not owning these stamps but maybe I'll find some in my stocking. Emma, you have outdone yourself!! I love your Elf money holder. I just picked up that cartridge and cannot wait to use it now. I am having so much fun with your 12 days of Christmas. I'm loving these ideas. I think I may have to use this one. I always try to find a cool way to give cash for birthdays. This card is so cute. I definitely going to look for this cartridge. This is really a cute cart. Love all your projects. Your card is just the cutest Emma! Thanks for sharing and the fun giveaway! What a cute idea! Your videos are great. Thanks for all the time you put into them. Super cute as always. I also love this cartridge. thanks for all the great ideas. I don't have little girls, but I would sure love this cart! I love your card it is awesome. I will have to order that new cartridge. Thanks for a chance to win. This is sooo cute! I definitely need this cart! I love how you put the money in the wagon, very creative! Thank you for answering my question and for your comment on my blog, much appreciated! How cute! I love your card! What a great idea!! That is a cute way to give people money! I am going to have to do this! Thanks for the great idea! Emma this is so cute. I love the way you made that money holder! Super cute. That is the cutest card ever. I have been trying to figure out a card for my grandchildren for Christmas and this is perfect for them. I always give them some money in their card and I love the wagon idea for the cash. Thanks so much again for your creativity and for sharing. Oh my goodness!! Super cute! Great job Emma! Omigosh - he is adorable! And he does still look like a boy, polka dot, princess face and all! Awesome! Oh my gosh, this card is just so darn adorable, just makes me smile. Emma, you made such a cute card. It is a creative way to personlize your own money card. Fabulous!!! Wow Emma, your card is just too cute!!! Wow!! Emma, you outdid yourself on this one!! This is soooo cute!! What a great way to give someone some money! I LOVE it!!! Thanks for the chance to win. Cute cards! Blinkie is up! Your card is such a wonderful addition to the gift card style. I love it. So fun too. You have soo many cute ideas. LOVE it. OMG!!! I swear I just said to my mom I wanted to make some money card for christmas and then I opened your blog! This is so cute! I have this cart, I hope you don't mind if I scraplift this idea? Thanks for sharing and this awesome 12 days! Awww this is so cute Emma. I just love it. The elf is adorable. Thank you for sharing. your right this is a cute cart- and one i didnt pick up on black friday! what was I thinking!! This is just adorable, I love it!!! too cute - love it all!!! Great idea! omygosh! this is too cute for words! awesome! TFS! so far the cutets card I have seen. You are one awesome talented lady. thanks for sharing your work. AWWWWEEEE what a cute way to give money! I love it! absolutely adorable emma !!! 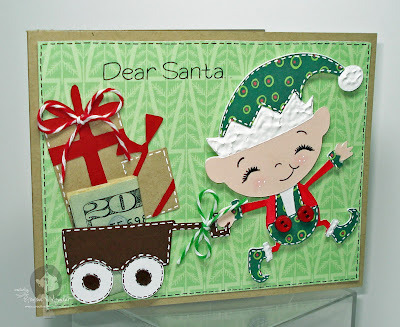 I need a money wagon LOL...very cute little elf!! soooo cute! i just picked up this cartridge just for the elves! cant wait to create! tfs! Very cute gift-card , card. Once again what a cutie. I love this little guy. I didn't get Jolly Cartridge but now I might after seeing him. what a great card. I love the "money" holder idea. Nice job. Thanks for hosting this. It has been great to see everything. What a cute idea! I am always looking for fun money holder ideas! ok Emma that little elf is so freaking cute...LOL why is it that when you make something I always say "Why didn't I think of that"....LOL Reason I'm not Emma...LOL Elfietabulous so darn cute. Love the elf is just adorable!! I got this cart and have yet to play with it. Emma I just love that card it is so cute. so adorable!! thanks for sharing! Absolutely adorable!! I love the Twinery, too. Your gypsy sleeve is the same as mine.....so fun!! Thanks for sharing this great money card with us. Oh my gosh this is the cutest card. I so love it!! Omg...this card is one of my favorites ever!!!! LOVE it! Emma, what a great idea. My family loves to get flat and thin. I'm always looking for fun ways to wrap it up. Thanks for sharing this great idea. I love the stamped face, it is so cute. I just did a card with this little elf and I love it. You did a great job :) Thanks for sharing! This card is too cute!! I love this cartridge!! I so want it!! I was really bummed that I missed it on Black Friday. The more and more things I see made with it just makes me want it more. Thanks for sharing!! What a cute way of making a money holder. Love it. Thanks for sharing Emma. Emma - This is absolutely adorable!! That Elf is da bomb. you are soooo creative, I have learned tons from you. Thanks! As always, cute project! Thanks for your continued inspiration. This hop has been so much fun. You and Nikki are doing a fantastic job. do you have one for gift cards??? (maybe that is coming up) by the way went and got stuff to make an ornament!!! Thanks emma. really cute card. Thanks for sharing your talents. OMG Emma love this idea.. love it.. yes.. i love my PK stamps.. Thanks so much for the chance to win this new fun cartridge !! I did get the Jolly cart during my black friday shopping but twinkle Toes would be fun !! Emma the ideas just keep coming one better then the next! Love this card. Oh my gosh! This is the cutest card ever!! I love it! Oh my gosh, is this the cutest ever!!! LOVE the color and the stitching you added really looks great. Thanks for sharing. Super Cute as always Emma!!!!! Oh my gosh Emma he is so stinking cute. Hubby came in and saw him too he like it a lot. I hope I can get the Jolly Holidays cartridge it is so cute. I love this card and the Princess face is perfect. Your card is so sweet. I would love to win the cartridge, what a great giveaway. I LOVE this card!!!! TFS! I just bought this cartridge and can't wait to play. Thanks for the inspriation! This is just to stinkin' cute!! I hope I can get the Jolly Holiday cartridge soon. It's still sold out on Walmart.com:( Thanks for a chance to win! This is the cutest card and great idea!! :) Thanks for sharing and the chance to win. What a great idea! The elf is so cute. What a Cute Card!! TFS!!! I just picked this cart up at Walmart on Black Friday and haven't even had a chance to open it! I'm going to have to get it out this weekend after watching your video! Your right...that little elf is super cute! Love you card!! Adorable I love the elf, thanks again for the inspiration! This is one cute elf. I got this cartridge but I didn't even notice the elf. Now I am going to have to try it. Girl you are killing me! I am so going to have to get Holly Jolly now. The elf is sooo stinking cute!!! I skipped the tutorial though since I don't have a gypsy. How archaic of me! That is the cutest elf I ever saw! Emma! Your cards get cuter and cuter! I would LOVE to win Twinkle Toes. I have seen so many cute projects with this cartridge. Thanks for the chance to win. Oh my goodness this is SO adorable!!! Great job as always Emma! I just got Jolly Holidays and have not opened it yet! I am so excited...your elf is adorable! Emma you are so right, this is the cutest elf ever. This is soooo cute! I'm always looking for ideas how to put money in my cards and this has my creativity going. Thanks for sharing. new to Cricut, and I do not have any Holiday cartridges yet, this would be awesome! How cute Emma. I love it as always. Thank you for sharing with us! so cute!! Love the elf! I love this little elf he is adorable and thanks for the designing tip that was really great and timely. You make it all look so simple. I can't stand it...your card is sooo stinkin' cute Emma!!!! He's adorable. You're amazing, the things you come up with!!! Thanks for a chance to win the twinkle toes cart!!! Oh My Goodness, this is such a cute & clever idea... I love it! Twinkle Toes is so on my wish list (who am I kidding, they are all on my wishlist)!! OMG! Sooooooooooo cute I can't stand it! Love that ELF!!! Wow keep the money and just give me the card...How stinking adorable!!! Thanks for the chance to win this great giveaway. OMG! That money holder so sooo cute!!! I love the idea! i almost didn't even see it, it blended so well with the packages! What a cute idea. I love this Jolly Holidays cart. Wish I had gotten it. Twinkle toes is the 2nd best new lite for sure. Emma!! This is the cutest little elf I have ever seen!!! It makes me want to make one right now!!! I don't have this cartridge but I will definitely go get it tomorrow!!! Thanks for another great idea and for giving us another chance to win a cartridge!! What an adorable card, even without the money in the pocket. I love the Twinkle Toes cart and my grand daughter will as well. Thanks for the opportunity. Love your videos. Emma, I absolutely love that elf. I have the cart but still have to get it into my gypsy. Once that happens, I'll be using him for sure. Thanks for sharing. I so love this elf also. I used my cartridge the same day I purchased it on black friday. I have done a layout with the elves in this cartridge. But I never thought of making it as a money holder. Super duper cute. I also love the pattern paper you used for his clothes. Thanks for sharing all of your projects. Thanks for a chance to win this cartridge. I have finally been able to put your button on my blog. This card is too cute! I love all the details! Thanks for sharing!